Kansas City (Feb. 1, 2019) — The Columbia Missourian has won 18 awards in the 2018 Associated Press Media Editors Newspaper Contest, including the General Excellence award for Division II, newspapers with a weekly circulation of 25,000-150,000, recognizing the newspaper with the most individual awards overall. Nineteen newspapers submitted a total of 413 entries. The Missourian wins show “the tenacity of our reporters, the expertise of our faculty journalists and the success of the Missouri Method,” said Ruby Bailey, executive editor of the Missourian and Missouri Community Newspaper Management Chair. 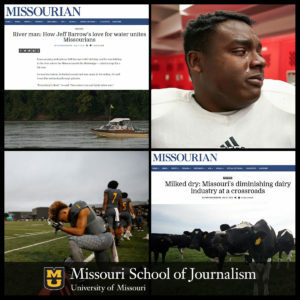 Staffed by Missouri School of Journalism students who do the reporting, design, copy editing, information graphics, photography and multimedia, the Columbia Missourian has won 18 awards in the 2018 Associated Press Media Editors Newspaper Contest. The Associated Press Media Editors is a nonprofit, tax-exempt organization of newsroom leaders and journalism educators that works closely with The Associated Press to promote journalism excellence as well as a professional network for helping editors and broadcasters improve their news coverage and newsroom operations. Nationwide, the AP represents 1,400 newspapers and 5,000 broadcast stations.